This book is a cultural journey into our living quantifiable society through the unusual viewpoint of digital philosophy. In five easy chapters, the book unveils: the hidden nature of software data code, the artificial dawn of a new data sensorium, the invisible power of data algorithm, the datum as the new human experience, the emergence of accidental megastructures called data platforms, and more. Beyond engineers, programmers. 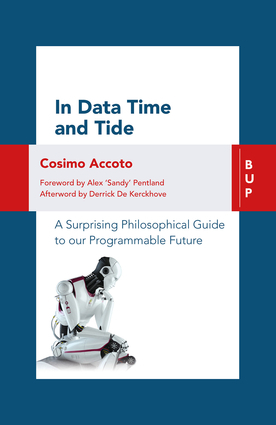 and coders' tech narratives of data revolution, philosophers have their own provocative thinking on current and future technology. This book popularizes and intertwines speculative visions from untold and surprising approaches to tech businesses, such as the shift from feedback to feedforward, the new living sensorial environment, the end of experience as we know it, the digital space as transduced space, and the programmable nature everything from money to law to society. Cosimo Accoto is a Research Affiliate at MIT. Previously he served as Partner & VP Innovation at OpenKnowledge, where he helped the organizations envision and enable their digital business transformation. He also served as Commercial Director at Memis, Head of Business Development at Jupiter Media Metrix, Sales & Service Account at Agb Italy, and as a Lecturer in Digital Analytics & Big Data at IE University in Madrid.